Guruji’s Shishyas used to go for His darshan almost every day when He was in His physical form. Many times, they were Blessed with gracious times with Guruji, when He would talk about many things to guide His Shishyas. Sometimes they would just sit together and share some light moments with Him. In one of His lighter moods, Guruji had spoken a few lines which were immediately noted down by His shishyas present with Him at that time and those few lines are presented in the form of a Nazm (poem). This short poem has deep meanings about life and Guruji Himself. It is presented here for you to read, learn and enjoy the Bliss. Khelta kaun hai, kis ka khilauna kya hai. jald le jao, is dher mein rakha kya hai. (We spend our lives thinking that the people around us, whom we love are the only truth in our lives. Many times we ignore the path of Bhakti (devotion), Sewa (Service) and Jaap (Meditation). It is not wrong to care for our loved ones, but to totally ignore the other aspect is also not correct. The burden becomes known as the soul leaves the body. The same loved ones no longer remain capable of holding the body any longer. They have no option but to take it away for its last rites. What remains then is the level of Bhakti, Sewa and Jaap attained during that life-span). phir hamesha ko bhula denge, tu samjha kya hai. Teri ginti hi nahi, daulat ko tu ginta kya hai. Main to Paras hoon, Paras ko parakhta kya hai. (All those who come to me seeking to fulfill their worldly goals… must understand that I am that Spiritual Super Power who can turn anything (anybody) into Gold (Spiritually uplifted)… The Shishyas of Guruji who have been created by Him from among the people are an example of His Midas touch. I am the creator of personalities who can guide anybody into accomplishing his spiritual goals. It is futile to test me with worldly parameters, for I am the decision maker. I am the Paras – (the touchstone) who can test any metal and turn it into gold without changing shape or my properties, but no metal can test the Paras and retain its originality. If it tries, it will be converted from its original form). So, when I test you, I have a choice of making you pure as gold and take you further on your onward journey, but when you try to test me, I again have the choice of responding or not. Flow with me and live in Bliss). One Destination where the real peace of life lies……Depends on us how we grab it…. Guruji aap ki kripa aur aapke naam matr se hi sare mushkil kaam sahejta se ho jaate hai, O mere Guruji aapko koti koti pranaam jo aapne humme apne bhakt ke roop me sweekaar kiya. thank you Guruji mera saath dene k liye……thanx a ton. 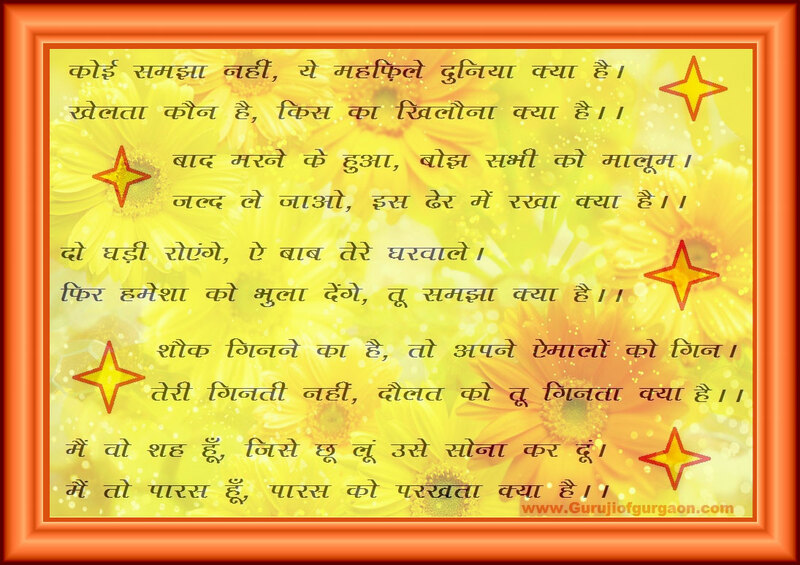 Jai Gurudev ji… Undoubtedly he is the gem of gems.. M touched with such deep words. Thanks guruji for being there always & making me walk on the right path everytime m lost somewhere. Jai Gurudev Ji. Aapke Sri Charano me Shat-Shat Naman! Main aur mere sampurna parivaar par aapki kripa aur aasheesh sada bani rahe. Puiya Mataji ka Varad hast hamare upar sada bana rahe!Yahi prarthana aur vinati hai.Jai Gurudev! OM SHIV OM OM NAMO GURUDEV! he mere Maalik aapko koti koti pranam… kirpa karo he Gurudev….aap apna pyar mujhe dete raho…..
Guruji pranaam,aapki mahima apram paar hai. 1998 me meri didi ne muje aapke charno me jagah di,tab se aaj tak aapne itna chamtkaar kiya hai, is tarah sab per kirpa barsao. aaj 16.05.2013 ko me apne bacho or bahu ke saat staan per matha tak ne ja raha tha ke achanak meri car ka tyre fut gaya. hum sab aapki kirpa se bach gay,thodi dur aage dekha to ek rab ka banda apni car ki stepney badal raha tha, mene us se kaha ki meri stepney badal do, to us ne 5 minute me mera ye kaam ker diya,or me sthaan per pahuch gaya,such me guru ji wo or koi nahi aap he the, nahi to high way pe koi mistri dur dur dekhne per bhi nahi milta. jai ho Guru ji or Guru mata ji ki. sab per kirpa karo . Guru ji you are alway’s with us and within us, without you we are nothing may you always bless us for ever. What we have is your’s not belonged to us nor will it ever. Guruji makes his children realise the ultimate truth of life. Guru dev ji apko barambar pranam hai……..
No words to describe my Maalik..bas ..AAFREEEEEEEEEEEEN..!!! bhaiya aap k paas to guruji ka khazaana hai……plz aur share kariye…..
Just to good realty of life written in such simple way… Jai Gurudev! !! The entire truth of life shown to us in just a few sentences. cant think of any words to describe. v just bow down our heads in front of The Greatest of The Greats. PRANAM GURUDEVJI. really heart touching… jai guru dev. > Aunm Namah Guru Dev. Amazing…………. these words can only be of the Master of Master”s!! such deep knowledge in just a few words, it can take us life times to understand. We bow before you “O” Greatest of the Greatest.!! Jai Gurudevji. Solid, authentic and rhythmical. Yeh Wohi keh sakte hain aur sirf Wohi kar sakte hain. Hum aapki sharan main hain Gurudev Maharaj. You made me to come to You though too late to see You, I neither eant to become gold nor else; I could not become a true human being. You have put me in faith for You & You shall carry me along because You love me irrespective of my vices & virtues. Shat shat Pranaam Guruji ..! guruji ur paaras pl touch me with your blessing…please help me to overcome my pains..i cannot cope without u anymore..pl help your daughter.. Such deep knowledge in just a few words, it can take us life times to understand. We bow before you “O” Greatest of the Greatest.!! Aapki Mahima aprampar hai. Hum bhakton ko apni sharan mein rakhna or kripa karna. Guru ji mere aur meri family par aap apni kripa hamesha banaye rakhna aur hum sabko apne charno m rakhna . Jai Gurudev . jai Gurudev ji. Aapse mujhe jo tension free life ka maja mila voh kisi bhi paise se nahi kharida ja sakta. Sadguru Maharaj ji ke paavan shree charno me shat -shat pranaam, hey Maalik ek prathana ki aapka hath sada iss bhakat ke shish pe rahe….shat shat pranam mere Maalik. Pujniya Guruji and Mata Ji ke charno me koti koti pranam. we all are blessed with guru kirpa and pray for Guru Ji’ kirpa and ashirwaad for everyone. mere Maalik ke charan kamal me barambar pranam, mera Maalik se prathana, hame sadbudhi dijiye aur meri har galti ko maff kar dijiye. Jai Guruji AUR Mataji… Aapko Koti Koti Pranam. Hamesha hum pe apni kripa banaye rakhna. Guruji ke charnon me barambar pranaam. Gurudevji Ki Kripa ka hum koi varnan hi nahi kar sakte. Past, present aur future, sab wohi hain. No words can express his love for us. Gurudevji Aap ko koti koti pranam. sadaiv Aap ki sharon mein rakhein and Aap ki nek Raah pe chalate rahe. Jai Gurudevji. Sirf Aap hi hume sahi raah pe chala sakte hai. Aaj to Guruji aap ki kripa se hee hamari gadi sadak ek gaddhe se bahar nikal payi.Gurgaon ke sadak ke Gaddhe main Gadi ka front side baith gaya tha.Sirf damage hua Gurudev hum sakushal Vasant Kunj Pahunch Gaye.Koti Koti Pranam Gurudev Aani Kripa Mere aur mere parivar pan banaye rakhen. for everyone that they may get your love and blessings throughout their life. We all are very lucky……that we in Bhole Baba’s shharan.A lot of people dont even know this aspect of life. So thank Bhole Baba everytime and spread positiveness. in your Divine Lotus Feet Guruji and Mataji my soul remains forever, i am in debt to you always and want your blessings for eternity,janam janam i ask for your Ashirvaad and Sateh Prem Sewa…Om Namo Shiv Om Om Namo Gurudev. GURU JI AUR MATA JI ko KOTI KOTI PRANAM. You made me to come to You though too late to see You, I neither want to become gold nor else; I could not become a true human being. You have put me in faith for You & You shall carry me along because You love me irrespective of my vices & virtues. Left home in 2006 for overseas education in australia forgot my family there and lived like a fool came back to India, got job placed by guruji worked there and found the true path to follow. simply magical in forigners language and aapne mujhe bacha liya in Hinustani Bhasha. sabh kujh aapke saamne hai Guruji galtiyaan maaf kar k sahi karvaate rahiyega. JAI GURUDEV JI TO ALL. I do not fear and had left everything on my Gurudev , the day I read in his room. sada apne shree charno main hum sabko banaye rakhen. Jai guruji. Shat shat pranam. Guruji ke charno me sadar pranam. I am going to Guruji sthan of Gurgaon, from last more than 10 years. Still going there,Guruji turned me from Runk to Raja with his blessing in this period of span. He took care of my family in every aspect of life.My Guruji is a cluster of blessing, ” HE is PARAS there is no doubt” I can’t live without him. Guru ji ke charno me koti koti pranam. HEY GURUJI APNA ASHIRWAD BHARA HATH HUM PER SADA BANAEY RAKHANA .APKI K DAYA DRESTI PER HI HAMARI JINDAGI TIKI HUI HAI. AP KO SAT SAT PRANAM. Hai nath meri naiya usse paar laga dena…Ab tak toh nibhaya hai… Aage bhi nibha dena …. Hum bacchon par apna aashirvad sedhav banaye rakhna …. Shath shath pranaam. Jai Gurudev..Har Har Mahadev….Om namah Shivay..
Association with Gurujiby any way gives the assurance of me being the playing kid and he being the watchful father nd mothet on me. Lucky to be here,very lucky. Paalan haar. Saakshaat devo maheshwaraah Gurudev maharaj aap prernaa strot hain mere. Ab me aapki sharan me hun.. abhaya daan dijiye pushtivrdhanam kijiye kalyaan kijiye paarbraham swarup. Sadaa sarvdaa apne sarvshaktiman maha maheshwar swarup se sanjin kare naath . Apni kirpa sadaa sarvda bnaaye rakhen naath. Jai ho mere naath aapki jai ho. When the Guru is not physically present in front of the devotee, it must not be forgotten that Guru is present everywhere. In whatever is visble to the eye as well as in what is not visible to the eye. 1. Kabhi kisi par KRODH na karo. 2. Apne Mata-Pita par kabhi bhi KRODH Na Kare. 3. Subhah uthatehi apne HATHELIYO ke darshan kare. 4. Seva Milne ka AHANKAR na kare. 5. KAAM, KRODH, LOBH, MOH aur AHANKAR se bache. Guruji ka sthan sab Devi-Devtaon ke baad aata hai, jo ki SAB SE UNCHA hai. Guruji ki Jai.Ashirwad dijiye Guruji mera sab theek rahey hamesha. Hey guru dev aap saakshaat bhagwaan shiv hai.aap ki kripa jise mil jaaye uska kalyaan ho jaata hai. Om namoh shiv om. Om namoh gurudev. Jai Gurudev Ji . Jai Mata rani. Om Namo Shiv Om Om Namo Gurudev. Shat Shat Parnam Devo Maheshwara. Excited to be on Guru Poornima this year. GURU bina manav ka uddhar nahi …. Gurudev apne Shishyo aur Bhakto ko ‘MANAV SEWA” par tatpar rahne aur yeh hi sarva shreth SEWA aur BHAKTI KA MARG batate hai. Guruji hamesha kahte hai ki… SEWA Kare Nirlep (without desire / return of anything) woh Bane Prabhu ka lal…. Gurgaonwale Baba tune kardiya kamal. Jai Gurudev aur Mataji ke charano me pranam !. GURUDEV KE CHARNO ME KOTI KOTI NAMAN. GUUDEV AAPKA AASHIRWAD HAMESH BANA RAHI.. Thanks Guruji for everything…….kripa banaye rakhna……Jai Guru Dev. Guru ji evam Mataji, annant koti Pranam! Guru ji …Har ek swaans me Aap ka ahsas rahe! Har ek ghadi aap ka aashirwad mile! Har ek Drishya me Aap he se Shakchatkar ho! Pranaant tak aap hi ke saamipya ka bhan mile! OM NAMO GURUDEV. Malik aapka aur Mataji ka charan ka dhool ko mera sashtang pranam. Malik apne apko, Mataji aur apne sthan ke sabhi ko Srikrishna Janmashtami ki Shubkamnaein aur Aap ke charan kamal ke dhool ki krupa hamare upar sada ke liye bani rahe. Jai Gurudev ji…Jai Gurumata ji….